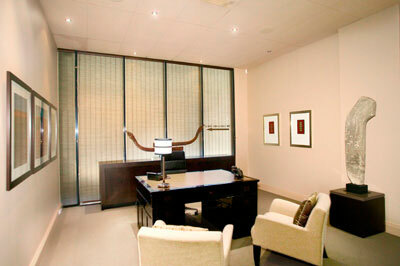 My consulting rooms are at Suite 45, 26 Belgrave St., Kogarah. Enter the rooms from the Kensington Street side. Please refer to the map. Our office hours are 8.00am to 4.30pm, Monday to Friday. I am available for consultation by appointment each day and Thursday afternoons till 7.00pm. The late consulting on Thursday afternoons is good for pregnant women who are still working and for partners to attend. To make an appointment call 02 9588 5155 or 02 9588 5133 during office hours. Our fax number for any results, doctors’ letters etc., is 02 9588 5233. To contact me during office hours please ring the rooms. Out of hours or if there is no response from my rooms, ring the Delivery Suite where you are booked. I do not work every weekend. I am on call one weekend in four. On the weekends I am not available, my colleagues, Drs James Opperman, Emmanuel Karantanis and Trent Miller provide cover. We all practice obstetrics in a similar way and if you have any particular requirements or risks they will follow the plan that we have made prior to labour and delivery. The hospital where you are booked will know who is covering me and can contact that doctor if you have a problem or go into labour. Our on call system runs from 5.00pm on Friday through to 6.00am on Monday morning. If you are already in labour on Friday I would continue to care for you until the baby is born with rare exceptions e.g. I have a holiday booked and plane to catch. I have two administration staff, Annie and Ashley, who will answer your calls, make appointments and receive you when you come in for an appointment. To try and provide more rounded care for my pregnant women I have recently employed Sallee, a midwife who will see you at the rooms two to three times during your pregnancy and discuss midwifery matters. When she sees you I will also be consulting so if there are any problems she can speak to me directly. After the birth she will come and visit you at home and be available for calls about any postnatal problems, particularly breastfeeding. For those women needing gynaecological surgery, I have a nurse, Michelle, who arranges my operating theatre lists. She will discuss the procedures, booking and financial costs for your treatment either in the rooms or by phone if this is more convenient. She will ring you after surgery to make sure that your recovery is progressing uneventfully. Click here for a virtual tour of the rooms. I am accredited to deliver babies at St George Hospital, St George Private Hospital and Hurstville Community Hospital – the choice is yours. However, should you decide upon another hospital I will recommend another obstetrician. Every pregnancy is different and at times you will need more support from us. I can always be contacted for urgent matters and Sallee is also available during office hours. Most days I will be able to see you the same, or the following day, if necessary. However, many of the problems in pregnancy can be dealt with over the phone so please ring Sallee or me if you wish. 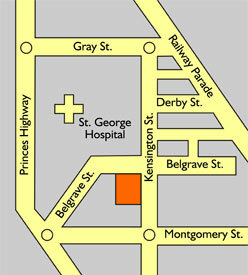 A/Prof Gregory Davis Consulting Rooms Suite 45, 26 Belgrave Street, Kogarah Click below to download a high resolution PDF file of the map.